'2014 Was A Catastrophic Year,' Amnesty International Says : The Two-Way The group faults the U.S. on a range of issues, including the use of excessive force by police. It also says governments "must stop pretending the protection of civilians is beyond their power." Citing violence and a refugee crisis in Syria and elsewhere, Amnesty International says international groups haven't done enough to help. 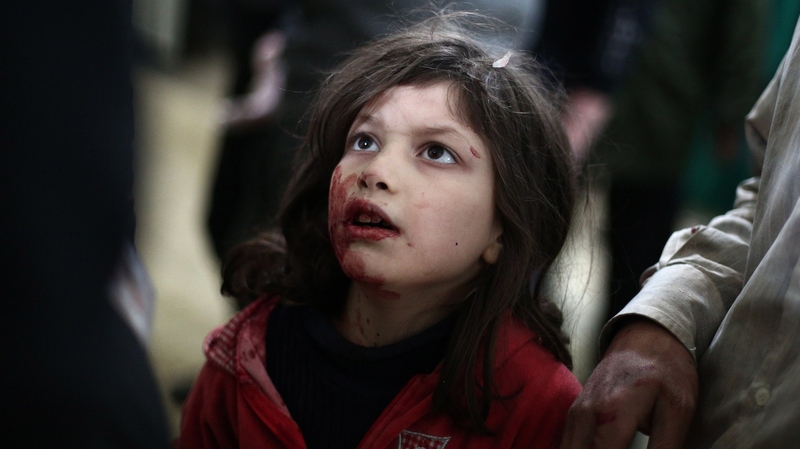 Earlier this month, an injured Syrian girl was treated at a makeshift clinic, after government air strikes on a rebel-held area northeast of Damascus. Governments "must stop pretending the protection of civilians is beyond their power," Amnesty International says in its human rights report for 2014. The group faults the U.S. on a range of issues, from the use of excessive force by police to rights abuses in the name of fighting terrorism. "Governments pay lip service to the importance of protecting civilians," Amnesty says. "And yet the world's politicians have miserably failed to protect those in greatest need." The group is calling for members of the U.N. Security Council to lose their veto power over issues of genocide and other mass atrocities, saying that vetoes by the U.S., China, Russia, France, and Great Britain have been "based on vested interests or political expediency." Amnesty listed Syria, Iraq, Gaza, Israel and Ukraine as places where the Security Council "has failed to deal with crises and conflict, even in situations where horrific crimes are being committed against civilians by states or by armed groups." Saying that "2014 was a catastrophic year for millions caught up in violence," the 424-page annual report lists human rights abuses in 160 countries. And the violence and rights abuses will likely only feed on one another, says Salil Shetty, Amnesty International's Secretary General. "From Washington to Damascus, from Abuja to Colombo, government leaders have justified horrific human rights violations by talking of the need to keep the country 'safe,' " Shetty says. "In reality, the opposite is the case. Such violations are one important reason why we live in such a dangerous world today. There can be no security without human rights." The report predicts a "bleak" 2015, noting the growing influence of violent groups such as Boko Haram, ISIS and Al Shabaab. As for America, Amnesty notes that President Obama "acknowledged that torture had been carried out following the 11 September 2001 attacks" in secret CIA operations — but the report also faults the U.S. for not providing "accountability and remedy for the crimes under international law." "In April, the Human Rights Committee criticized the USA on a range of issues - including the lack of accountability for abuses in the counter-terrorism context, solitary confinement in prisons, racial disparities in the criminal justice system, targeted killings by drones, excessive use of force by law enforcement officials, the treatment of migrants and the death penalty. "In August, the Committee on the Elimination of Racial Discrimination also made numerous recommendations to the USA. In November, the Committee against Torture's concluding observations similarly covered a range of issues." Amnesty titles its subsection on the U.S. detention and interrogation program with one word: "Impunity." Calling for the U.S. to review its standards for the police use of force, the report states, "At least 35 people across 18 states died after being struck by police Tasers, bringing the total number of such deaths since 2001 to 602." In light of the report's overall tone of gloom and doom, Shetty notes that "even at times that seem bleak for human rights — and perhaps especially at such times — it is possible to create remarkable change." He adds, "We must hope that, looking backward to 2014 in the years to come, what we lived through in 2014 will be seen as a nadir — an ultimate low point — from which we rose up and created a better future."